Reel in some crazy fish with a little help. Fishing fans will enjoy Com2uS' Ace Fishing: Wild Catch, which recreates the sport in an easily accessible, arcade-style format. 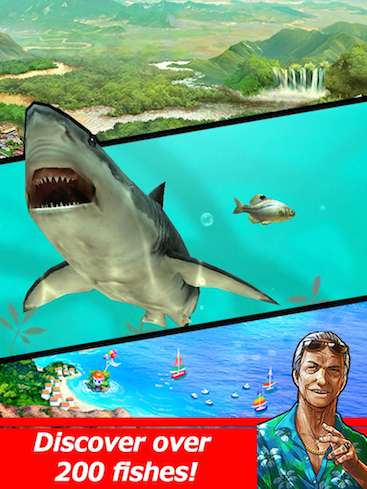 You'll change gear, visit different locations around an island and chase after the biggest fish through breathtaking struggles. On that note, these tips will help you catch a whopper! How do I get a good cast-off in Ace Fishing: Wild Catch? You'll start the round by casting your line into the water. As you do, you'll see a meter going back and forth, with a small highlighted area in-between. Try to go for this area when you pitch your line, as you'll be able to achieve a 10-to-15 percent bonus after catching your next fish. It's easy to figure out the timing, and then just hit the button when it's in the proper areas. How do I reel in a big fish in Ace Fishing: Wild Catch? Reeling is quite easy, as you simply hold down the reel button to bring your line back into the boat. However, you have to maintain balance with the strength of the line, as it can break if it stays too far in the red in the meter above. Try to carefully manage between green (safe) and red (borderline) as often as you can, so you make progress reeling in your fish. For good measure, don't forget to jostle the pole when the situation calls for it. If a fish starts to get too out of reach, drag your finger to the left or the right, depending on the direction indicated to bring the catch back into radius. Don't do this, and he's likely to break the line and get away. How do I use power reeling in Ace Fishing: Wild Catch? As you continue to achieve progressive reels (about four or five in a row) without interruption, you'll start to fill up a power meter right beneath the line strength meter. Once this fills, drag your finger in an upward fashion and you'll power reel the fish closer to you. This comes in handy with bigger fish. How do I know what fish to catch in Ace Fishing: Wild Catch? It really depends on how well you cast your line. Your fish can vary in rating, from one to five stars. The lighter the fish, the less the struggle. However, the bigger ones are worth the capture, as you'll not only earn some gold coins used towards gear, but also a display model that you can put in your fish tank for others to see. In addition, you can also sell smaller fish if you don't feel like keeping them - but don't worry about this until you start catching bigger fish. How do I compete with friends in Ace Fishing: Wild Catch? Competitive fishing is part of this game, and all you need to do is check the leaderboards and try to beat people by catching fish for higher rewards. If you're discouraged at first - or your line keeps breaking - keep working on it. How do I upgrade my gear in Ace Fishing: Wild Catch? It's vital that you upgrade your gear, as you probably won't catch bigger fish in the game with the starting equipment. When you have enough gold coins, be sure to visit the shop and upgrade your fishing pole and lure. The better your equipment, the better chance you'll have snagging the bigger fish. Do I need to pay for anything in Ace Fishing: Wild Catch? If you're a devoted player, yes. You'll need to pay to fish in certain areas of the game, and for tackle challenges from other players. You receive 15 pieces of virtual currency to start, but to refill, you'll either need to use cash or wait a bit (a couple of hours) for the meter. In addition, you'll also need to spend a dollar if you fail a challenge and want to try again right away, but it's easier to quit and come back to it later. If you want to go for premium purchases, you can buy either gold or cash, ranging anywhere from $2.59 (for 19 cash or 41,000 gold) up to $124.99 (for 1300 cash). That's a bit ridiculous, so if you must spend money, stick with the smaller purchases, under $10 or so.